During the early 1990s the Persian Gulf War broke out when Iraq invaded the neighboring country of Kuwait. Iraq had accused Kuwait of stealing their oil, but the truth was they had their eyes on them for a while. Saddam Hussein attempted to make Kuwait an additional province of Iraq, but had to back down after the Highway of Death took place between Kuwait and Iraq. Highway 80 took the name after the coalition forces attacked the Iraqi insurgents on this road. The combat lasted for about ten hours, leaving nothing but a trail of burnt vehicles and dead bodies behind. The Gulf War was covered by almost every newspaper and television station around the world. The coalition that was fighting Iraq was composed by 34 nations, but the rest of the world also agreed with their position. The truth is that Iraq was completely in the wrong for trying to invade Kuwait, and they were stopped at the very same Highway of Death. The main forces were the U.S. military and the Saudi Arabians, along with British and Egyptian troops. They were in charge of closing off the main highway where the Iraqi troops would be making their way back to Basra. After the ten-hour combat, it was clear why the place was referred to as the Highway of Death. It continued to go by this name for several years, because it wasn't repaired until the late nineties. There were a total of 34 countries in the coalition, and Iraq was alone. 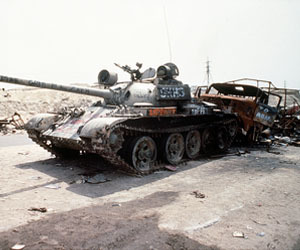 Towards the end of February 1991, Iraq started to see how difficult it was to keep the invasion. The UN had already met and decided that it was necessary for the coalition forces to stop the invasion. Infrastructure both in Kuwait and Iraq were massively destroyed during the exchange of fire. The war was coming to an end when Saddam Hussein ordered the withdrawal of the troops, but it still wasn't clear if he would give up the invasion plan. The troops took Highway 80 to return from Kuwait City to Iraq, but were surprised by the coalition forces on the route. After ten hours of combat the only thing left was the Highway of Death.